People usually have love-hate relationship with statistics. When you get your formulas right you are in love with it and when your answers go wrong, your feelings take the opposite route. But when you are working on statistics in Excel, things are simpler and less complicated. So today, we bring to you the most used statistical functions of Excel. One of the most used statistical functions in Excel is Average. Calculating the Average in Excel is much simpler than it was in the school. Simply use the Average function and select the range which needs to be averaged. 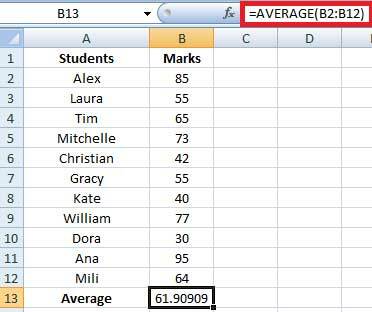 In the example below we want to know the average of the marks obtained by the students so we use =AVERAGE(B2:B12). Median is a function which is used to find the middle number in a given range of numbers. 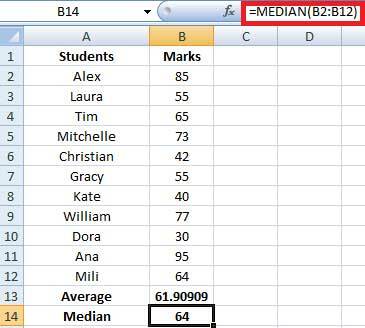 When you are finding median manually, you need to sort the data in an ascending order but in Excel, you can simply use the Median function and select the range and you will find your median. We take the same example as above to find the median of marks obtained by students. So we use =MEDIAN(B2:B12). Mode helps you to find out the value that occurs most number of times. When you are working on a large amount of data, this function can be a lot of help. 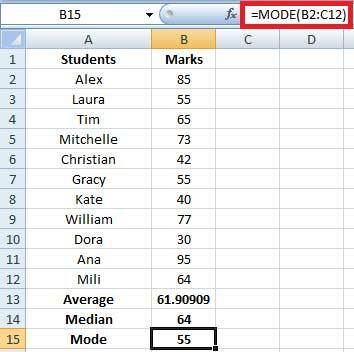 To find the most occurring value in Excel, use the MODE function and select the range you want to find the mode of. In our example below, we use =MODE(B2:B12) and since 2 students have scored 55 we get the answer as 55. Standard deviation in Excel helps you to understand, how much your values deviate from the Average or Mean that is it tells you that whether your data is somewhere close to the average or fluctuates a lot. If the value received is on the higher side then that means that your data has a lot of fluctuations and vice versa. 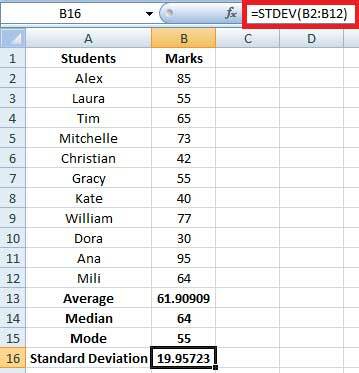 To calculate standard deviation in excel we use STDEV function. In the same example we shall use the STDEV function so our formula will be =STDEV(B2:B12). Our answer is around 20 which indicates that the marks of the students fluctuates a lot. We hope that your concepts about the statistical functions in Excel have been clear. If you still have any queries then feel free to mention them in the comments box below.